Hopkins has made getting your dinghy ready for travel quick and easy! Hopkins introduces Plug-In Simple! Wiring Harnesses for towed vehicles behind a motorhome. 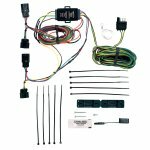 Each of these kits are vehicle specific and contain the necessary diodes needed for proper operation of the taillight, brake and turn signal functions for your dinghy. The Plug-In Simple! approach makes it easy to install and does not void the warranty of the towed vehicle as it eliminates all cutting and splicing. With a Dinghy Towing Harness, long, frustrating installations are a thing of the past!